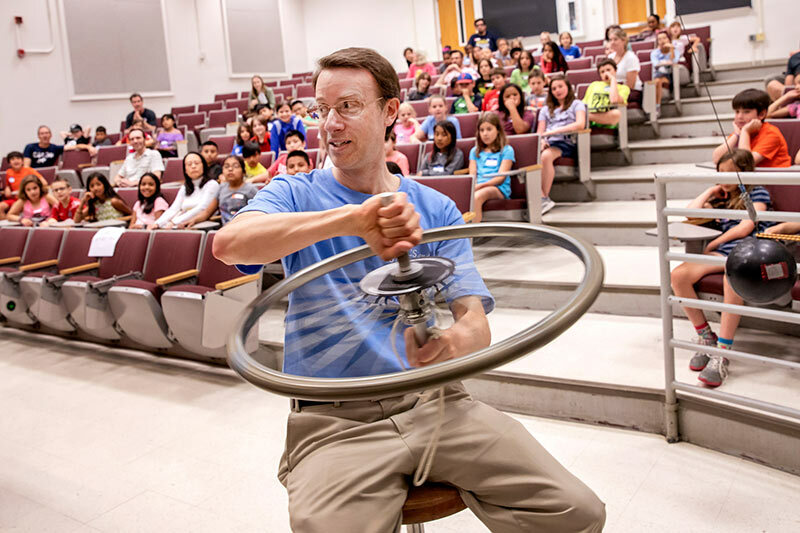 On a Tuesday last May, more than 300 fourth-grade students took the Department of Physics and Astronomy at the University of North Carolina at Chapel Hill (UNC) by storm. They came by bus and foot from three schools to participate in Science Is Awesome Outreach Day. No awesome day would be complete without liquid nitrogen ice cream. Image courtesy of UNC–Chapel Hill. Students rotated through a demo show, a hands-on Rube Goldberg machine activity, and a reverse science fair—an engaging event during which they listened to UNC faculty research talks and voted for the coolest science and best presentation. More than 20 volunteers participated, several from the local SPS chapter. SPS member Cameron Kass helped with the Rube Goldberg activity. “I will always remember my third and final group,” he says. The group designed a roller coaster–like contraption in which a golf ball rolled down a ramp and released a car that knocked down a bunch of dominoes. “Ultimately, the contraption failed, but it was an excellent teaching opportunity to let them know that failure is one of the most important parts of the scientific process and that they might make great scientists one day,” he says. 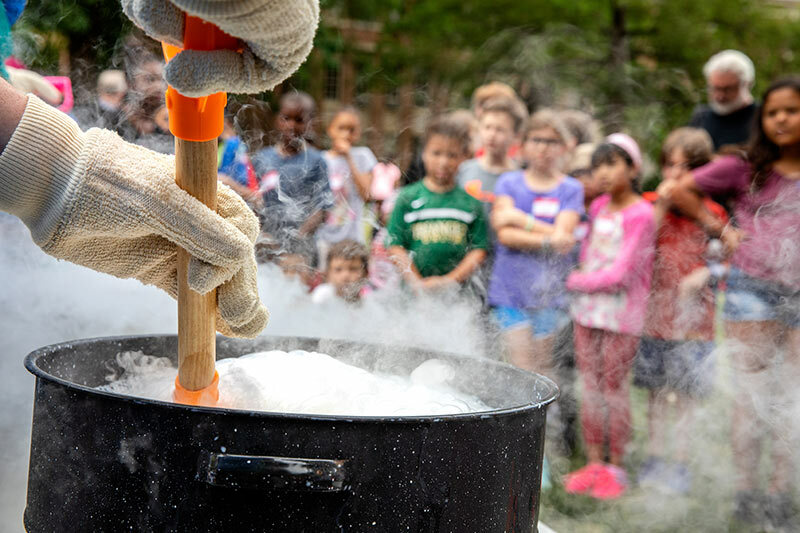 Science Is Awesome also aimed to introduce kids to a range of physics topics and encourage them to consider STEM careers, says physics teaching assistant professor and organizer Jennifer Weinberg- Wolf. 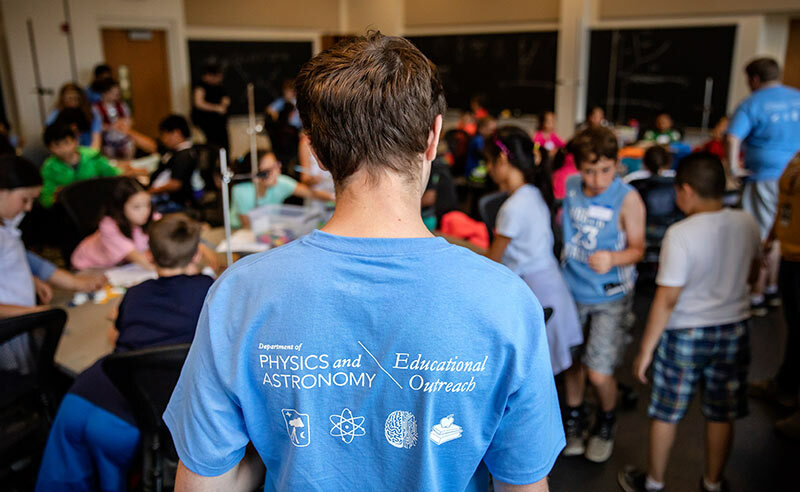 The program aligned with a fourth-grade curriculum but went further, including topics like fluid dynamics, extrasolar planets, and engineering organizational structures—topics UNC faculty are studying. The event grew out of a personal connection between Weinberg- Wolf and the local schools. After getting to know her own children’s teachers by volunteering to help with science activities, she started bringing classes on field trips to the department. Eventually, she brought whole grades from a nearby school one at a time. This inspired UNC physics department chair Christian Iliadis to ask, “Why don’t we make this bigger and better? Why can’t we help more kids and get them excited about science?” And so, plans were set in motion. Weinberg-Wolf took the lead on planning, and the Stirling Foundation provided financial support. Although this is one of its biggest undertakings, the UNC physics department often participates in community events, facilitated by an outreach group composed of faculty members, postdocs, grad students, and undergrads. The group handles requests for science fair judges, speakers, and other volunteers that come in to the department from community organizations. The department also hosts a big demo show on campus each year. If you are thinking about hosting an outreach event in your community, Weinberg-Wolf has a few recommendations. Recruit lots of enthusiastic volunteers, she says, and build in time on the day of the event for volunteers to have informal conversation with participants. Also, try to recruit volunteers from a diverse range of backgrounds, fields, and levels of experience. This increases the odds that participants will see a bit of themselves reflected in the role models. It’s also good for the volunteers. “For many SPS students, there was something that inspired us to pursue physics. Outreach events allow us to share that excitement and inspiration with others and sometimes even to rediscover it for ourselves,” says Bruff. Dr. Duane Deardorff engages students during the demo show. Image courtesy of UNC–Chapel Hill. Busy students work on their Rube Goldberg machines as a volunteer looks on. Image courtesy of UNC–Chapel Hill. It’s one thing to explain your physics research to peers; try explaining it to a group of 10-year-old students! In a fun event that was eye-opening for all involved, Science Is Awesome featured four 10-minute faculty research talks. These talks were judged by the fourth graders—each student submitted a ballot after the session, voting for “Coolest Research” and “Best Presentation.” Dr. Nicholas Law took home first place in both categories for his talk on the search for exoplanets and life on other planets. The students were also very enthusiastic about Dr. Daphne Klotsa’s research on organizational structures—or how penguins stay warm. To make sure the talks didn’t get too technical, Weinberg-Wolf encouraged faculty presenters to consider the interests of a typical fourth grader and put their day-to-day research in that context. Not only is this a good way to challenge researchers and engage visitors, it’s also a great way to introduce them to current areas of research—to some of the physics beyond rolling balls down ramps and calculating the density of objects. If you like this idea but need help funding an outreach event, apply for an SPS Chapter Outreach Award! Applications are due November 15.